Carcharhinus linkus – Ya Like Dags? What a load of bull shark. Photo by Andy Murch (elasmodiver.com). Over at The Endolymph, Dan shows us how concepts from otolith microchemistry can also be applied to sharks. 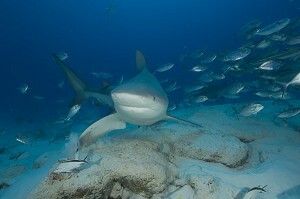 Across the pond, the IUCN is trying to get the EU to close loopholes in the ban on shark finning. I haven’t been writing much of anything on the recent series of shark attacks in Egyptian waters, mainly because it’s being covered quite well by the Dorsal Fin already. More oil spill updates from Deep Sea News, because we must never forget. And then to lighten the mood, Captain Snoop Dogg. There’s more going on in the mind of a fish than you might think. It turns out that female cichlids have what might be an “emotional” response to seeing their man getting beat up. When I was a kid, I used to have a type of catfish called a “shark catfish” in my aquarium. This proved to be an apt name because aside from being very streamlined and shark-like, it also had a very shark-like habit of eating everything smaller than it in the tank. Interestingly, this species is part of a complex of closely-related Asian catfish that are the basis for a major fishery and aquaculture operation in Southeast Asia, and now there’s a great deal of controversy over it. Mark Powell from Blogfish has been parachuted in to investigate. That’s all for this round of link dumpage. Enjoy.